Technology is shifting the competitive landscape of retailing in general, and the restaurant industry in particular. A key positioning trade-off for restaurants is between service-time and food-quality with quick-service restaurants (QSRs) such as McDonald’s (MCD) giving relatively higher priority to the former and fast-casual restaurants (FCRs) such as Chipotle (CMG) to the latter. By reducing/eliminating the customer need to wait during food-prep time, digital order-ahead allows FCRs to begin to close the service-time gap with QSRs and will likely accelerate the share-shift to FCRs which is already occurring as consumers become more food-quality and health-conscious in their dining choices (Exhibit 1 below), as well as displaying continued frugality in their spending habits (fast casual gaining at the expense of casual and fine dining). Some QSRs are responding by using mobile payments to reduce the customer need to wait during checkout-time and, in the case of MCD, introducing higher-end menu-items (to offset food quality perception) that involve longer food-prep time than a typical burger and looking to mitigate the adverse impact on service-time with digital order-ahead through a mobile app branded as “McD Ordering” being pilot-tested in Georgia. As both FCRs and QSRs look for technology-advantage in mobile order-ahead and payments, a critical choice is whether to develop in-house or work with third-party vendors. Pioneers, such as SBUX and PNRA, have developed in-house solutions but third-party vendors such as OLO (for order-ahead with Five Guys as a customer) and PayPal/Paydiant (for mobile payments with Subway as a customer) can reduce deployment cost and speed. The stakes are high: for example, OLO reports that restaurants using its order-ahead solution can see a one-third increase in customer visit-frequency and one-quarter increase in ticket-size. The increase in ticket-size can occur because, relieved of order-input particularly during busy periods, checkout staff have the time to follow suggestive-selling practices. Indeed, we see the next phase of mobile apps being around programmatic suggestive-selling leveraging the data generated from named customers to improve the relevance and timeliness of offers. We believe PNRA, along with SBUX, is one of the furthest-advanced in this application of the mobile channel. Like most retailers (including the MCX pay-and-save consortium), restaurants with a focus on mobile loyalty have deployed QR-code solutions because it is more expensive to upgrade point-of-sale to activated NFC terminals (which are less than 5% of the installed base in the US) and because mobile OS providers can restrict access to the NFC radio (as Apple has done). We expect this to change as EMV adoption increases the penetration of NFC-capable terminals and as third-party developers gain more open access to the NFC ratio (as in the case of Android M Pay, for example). This generates a service-opportunity for PAY since NFC-implementation of a loyalty program requires terminal software to handle split-tender transactions and support the updating of loyalty accounts. Of course, drive-through QSRs cannot easily use proximity technologies, such as NFC and QR-code, which is why the MCX solution will also integrate longer-range wireless technologies such as Bluetooth. More broadly, we believe that this theme only widens the divide between QSR and fast casual, positioning the less-than-forward thinking publicly-traded QSR companies as share-of-stomach donors to some private QSR concepts that have embraced technology more aggressively, as well as fast casual restaurants that have also embraced technology, as well as enjoying certain factors endemic to the sector (food quality, etc.). It wouldn’t surprise us at all, two years hence, to see most if not all QSR companies moving down the path with order ahead. Retail companies, to the extent they deploy new customer technologies at all, favor those which can lift sales through improving the customer experience. In our prior work on digital ordering and restaurants, we deliberately blurred the line between fast-casual restaurants (FCR’s) and quick-service restaurants (QSRs) in order to examine the opportunity for the entire industry in comprehensive fashion. 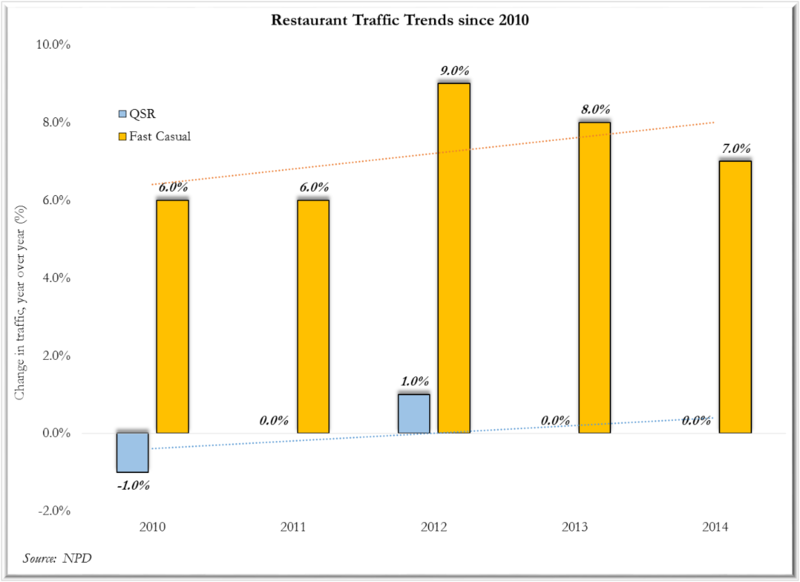 Putting a finer point on the difference, the reality is that digital ordering has penetrated fast-casual restaurants more than quick-service restaurants (and by a wide margin, to the point where QSRs have largely ignored the potential benefit) because of the longer food-preparation time of the former. Broadly speaking, fast casual restaurants enjoy the perception of offering better quality food to consumers, at the expense of longer preparation times while quick service restaurants are focused on service and prep times. Fast casual has successfully filled the gap between the traditional fast food restaurant and casual dining experience, outstripping the growth of both those segments as frugal consumers seek the value of better quality food at reasonable prices, served relatively quickly. For QSRs, time is literally money and for some concepts, up to 70% of their business may loop around the store, not setting foot inside. Historically, QSRs have displayed a willingness to make small changes to the drive-thru process in order to improve service times including such things as order confirmation boards and dual lanes. However, as menus and items have become more complex, improving service times has become increasingly difficult. As QSR menus are converging toward those of FCRs in terms of complexity, if not quality, FCRs have been attempting to close the gap with QSRs in terms of wait and service times. Through order ahead, FCRs can save customers an average of 12 minutes wait time (including line time pre-order and food-prep time post-order) while the time-save for QSRs is less since food-prep time is 1-2 minutes versus closer to 7 minutes for fast-casual. For QSRs, the bottleneck is more line-time than food-prep time so QSRs have focused more on digital payment (for its potential to shorten checkout times) than digital order-ahead. OLO, as a leading third-party vendor of cloud-based order-ahead solutions, reports the economic benefit of digital ordering for FCRs as an average 33% lift to customer visit-frequency (because customers prefer not to have to wait) and a 25% lift to ticket size (because suggestive selling can be programmatic while, for analogue orders, checkout staff may abandon suggestive selling during the restaurant’s busiest times). The aggregate benefit may be far higher because order-ahead lends itself to group-ordering and multiple entrée ordering as, for example, when a participant in a lunch meeting initiates an order and invites colleagues to join; in that way, through group digital-ordering, a loyal customer can serve as a positive advocate and distribution channel. While order-ahead has been the initial killer-app for mobile at FCRs, we expect suggestive selling to become increasingly important. Suggestive selling technology is still nascent at brick-and-mortar stores in general and FCRs/QSRs in particular. It is a matter of common experience that mobile offers are often generic leading as much to notification-fatigue among consumers as brand affinity. Retailers typically face two related problems in targeting and personalizing offers: the customer in any given transaction is anonymous rather than known by name; and transaction data are not systematically collected for marketing purposes. The contrast with, say, AMZN is striking: AMZN knows the personally-identifying information of a customer (assuming the customer logs in rather than checking out as a guest) and maintains a history of all that customer’s prior purchases. In addition to knowing what a customer has purchased, over time, AMZN also knows the universe of items not purchased relative to the transaction histories of a relevant peer group, and hence has an indication of how to focus suggestive selling. We expect the target-marketing capabilities of offline retailers to begin to converge towards those of online retailers as a result of customer adoption of mobile phones. Richard Fairbank, CEO of COF, made the point back in May 2014: “mobile can actually be the best opportunity to bring the tie back in the retailer’s favor [versus online platforms] when you think about the opportunity for real-time communications, real-time offers, for literally knowing where the person is in the store, for building loyalty programs, for point-of-sale and transactional ease and convenience, and ultimately all the data that can be collected there”. FCRs with a broad product selection, such as PNRA, will be the likely pioneers. While PNRA’s “pay and save” implementation has likely been less efficient and more expensive than that of a QSR or FCR that would undertake the same process today, some of the costs borne by the company as a first mover should yield benefits as PNRA continues to make process in tailoring its loyalty and rewards program so as to engage customers on a personal level. While not perfect, PNRA appears to us to be further up the curve (with a longer order history to support it) in terms of delivering rewards that consumers truly value and appreciate, to the advancement of the brand. A pre-requisite for suggestive selling is to identify the customer in each transaction with enrolment in a loyalty program providing the best opportunity to accomplish this. The resulting programs are referred to as “pay-and-save” because payments-integration ensures each transaction is recorded and offers-integration provides the customer with an incentive to enroll in, and use, the program. Scott Rankin, COO of MCX, makes the point “it is the integration of payments with value-added services [such as loyalty] that is the secret source that makes this work … payments-only applications have met with limited success”. He goes on to emphasize the importance of personally-identifying information: “mobile provides merchants with the opportunity to convert consumers from being anonymous to being named”. However, the integration of payments-and-loyalty in a “pay-and-save” program is not easy to accomplish. SBUX is the standout example and, indeed, My-Starbucks-Rewards (MSR) accounts for 33% of tender in stores and, in 2013, for over 90% of all US mobile payments. A unique feature of SBUX is the high visit-frequency of loyal customers for whom it can therefore make sense to establish a prepaid balance on a card (more so than prepaying for future purchases at, say, Home Depot). The low enrolment barrier means customers can be incentivized to participate with relatively minimal rewards so that Chief Strategy Officer Matt Ryan can report that “despite the cost of the discount, the rewards that we give people, the net profit per customer actually increases and importantly the act of joining signifies and produces incrementality on a customer-by-customer basis that results in very, very strong growth for us”. The contrast with the Target RED card, which is a decoupled debit card, is striking: there are meaningful enrolment frictions (because a customer needs to provide bank account details) which TGT overcomes by offering the very significant inducement of a 5% discount on all purchases. Nonetheless, the payoff to “pay-and-save” programs in allowing a retailer to personally identify a customer and assemble a transaction-history for each customer as a basis for personalizing ads and offers is so significant that we expect more retailers to follow the precedents of SBUX and TGT. Indeed, the retailer payments consortium MCX, whose members account for ~$1.2tn of US retail spending of ~$4.3tn, expects to roll-out a multi-merchant version of the TGT RED card program over this summer. It is important to emphasize that this is not so much about lowering card acceptance costs (given only 25% of tender at MCX member-merchants is from network-branded credit cards) but more about improving marketing effectiveness through identifying customers and assembling their transaction histories. As consultant Richard Crone has commented “the mobile wallet is a marketing platform, not just a wallet”. In practice, we expect a mixed pay-and-save system to evolve with all mobile payment solutions incorporating loyalty so that the earning and redemption of loyalty rewards is integrated into the main payments stream. That said, the initial launch of Apple Pay does not integrate loyalty and, indeed, Apple has restricted the NFC radio to a payments-only function and limited radio-access to Apple Pay rather than opening it to third-party developers; in part, this was to provide an assurance about security for a pioneering innovation when it was released in October 2014 and we expect the constraints to be relaxed next year (in the same way that developer-access to TouchID was initially restricted when it was first released with iOS7 but then opened up for third-party apps in iOS8). Android Pay is already more developer-friendly since the NFC radio can support loyalty as well as payment streams (as illustrated by the integration of payments with My Coke Rewards) and can be accessed by third-party apps. As payments and loyalty are integrated in NFC solutions, there is an opportunity for terminal manufacturers, particularly PAY which ships 50% of new terminals in the US, to provide the terminal-based loyalty apps allowing merchants to accept split-tender transactions (i.e. across loyalty rewards and a primary funding account) and maintain a customer-synchronized record of earned and redeemed rewards. Stream-lining the customer point-of-sale experience so that a single checkout action can handle payment, the application and updating of loyalty balances, the earning and redemption of coupons, and the provision of a digital receipt. Using mobile as a platform to engage customers more deeply and, in particular, authenticating customers (through the log-on to the retailer app for payment) so that, rather than being anonymous, they can be personally-identified and their transactions can be aggregated over time by customer name to enable improved personalization of ads, offers, and the shopping experience more generally. Moving the industry towards bilateral negotiation of card acceptance fees levied on large retailers accepting card-tender by the large banks issuing it as opposed to the current setup where these fees (referred to as interchange in the case of the branded networks such as V and MA) are set by the networks thereby (because of honor-all-cards rules) forestalling any price-competition between banks to provide payment services. Many retailers will turn to third-parties to implement these capabilities leading to opportunities for vendors such as FIS which can support the processing of decoupled debit transactions given connectivity, arising from its core issuer services business, to more than half the checking accounts in the U.S. and its ownership of mFoundry whose members built the early iterations SBUX mobile app. Since retailer apps are not dependent on the open-loop infrastructures of Visa and MasterCard to clear and settle transactions, they can explore alternative credentials-transport to NFC including QR codes (which do not involve the meaningful point-of-sale upgrade to NFC terminals and allow much broader utility than NFC solutions given that fewer than 5% of US POS terminals are NFC-activated) and Bluetooth (which is more appropriate than the very short range capabilities of NFC for drive-through establishments and pay-at-pump gas stations). Second, there are cloud solutions such as OLO and PayPal. OLO is the leading provider of digital ordering solutions to FCRs and has recently announced a partnership with LevelUp to integrate loyalty. And PayPal is uniquely positioned to support retailers in implementing mobile order, pay, and save solutions since its combines a branded authentication services (better known as the PayPal buy button) allowing discovery of the customer name with a gateway service (providing an interface between payment acceptance software whether in-browser, in-app, or at physical point-of-sale) allowing aggregation of transaction data in a common pool regardless of channel. PayPal-owned Paydiant already provides white-label mobile app services, including to Subway, and tokenization services to MCX and we expect PayPal to extend these relationships to include more comprehensive support for payments data-enabled fraud risk management and marketing with the PayPal buy button being bundled in. locally-sourced, their own service times are unlikely to decline or may even increase. Therefore, on a relative basis, we see the more forward thinking fast casual restaurants such as PNRA as better positioned for long-term success than the large QSR companies that have been slower to embrace order ahead, mobile payments and loyalty. That said, the landscape can change rapidly, as there are off the shelf solutions (OLO, as an example, mentioned above) that can be put in place in relative quick fashion. In addition to the technology, we see tweaks to the outside loop around the store as likely necessary as well, including such potential changes as a separate lane/outside kiosk that allows loyal order ahead customers to effectively the “bust the line” and restore the eroded time savings element that has historically represented the competitive advantage of the QSR segment. We expect that, absent the adoption of mobile strategies, QSR restaurants will continue to donate share of stomach to concepts that embrace technology and offer reasonable quality food in relatively speedy fashion, potentially either technology enabled fast casual or quick service restaurants.